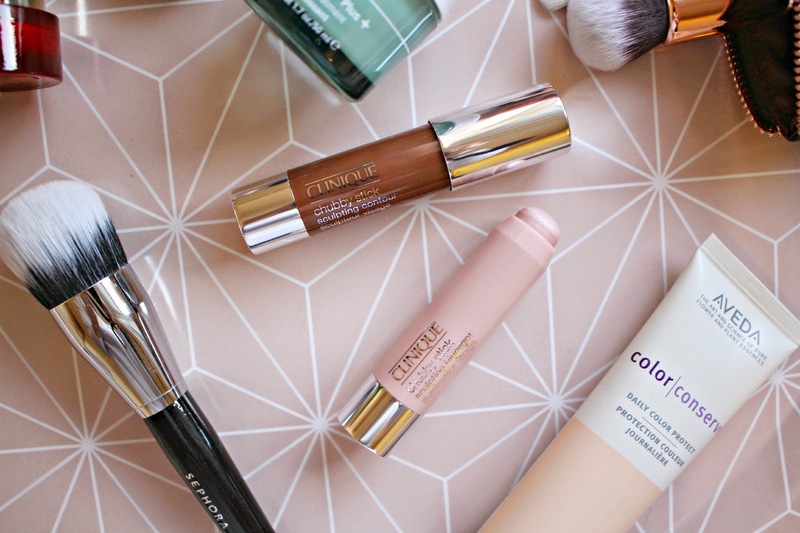 Welcome to my first EVER monthly favourites post! One of my blog goals for 2015 was to create a schedule and actually stick to it, and within my schedule I thought it would be great to do a monthly favourites. Often there are products which I’ve been loving throughout the month, but may not have made it into a blog post, so this gives me the opportunity to share all of those products with you! 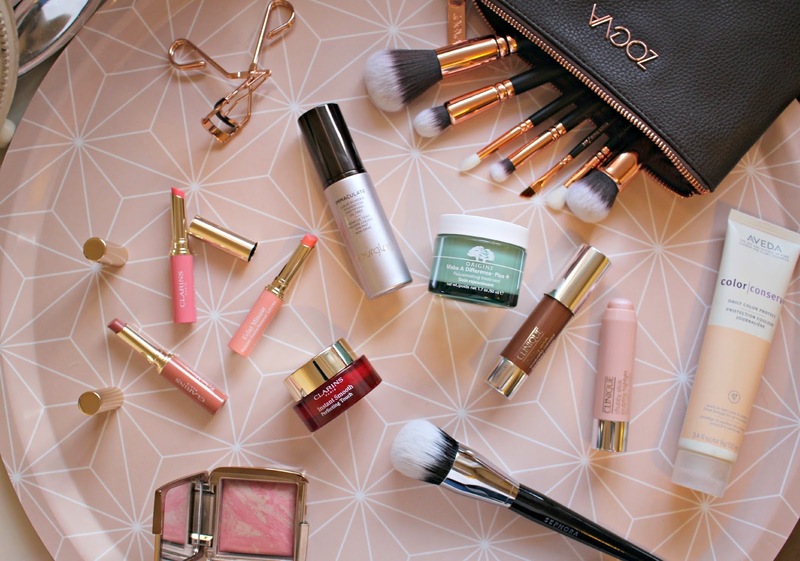 This month there’s a lot of beauty products as I have been kinda spendy this month! 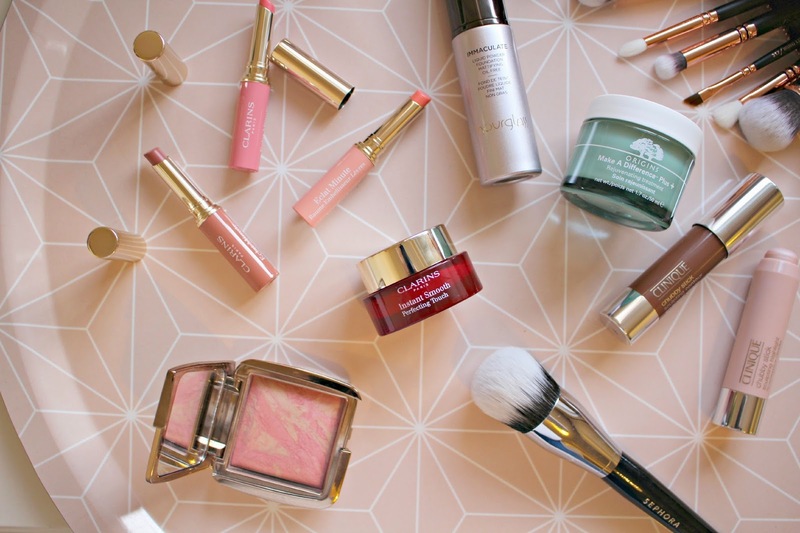 With a Sephora haul at the beginning of the month, as well as some exciting Spring beauty launches, there’s just so many products that I want to tell you all about! I’ll start with haircare. I had my hair coloured recently and I love my new shade, and am trying everything in my power to fight the fade! The easiest product to slip into my daily routine has been the Aveda Colour Conserve Daily Colour Protect. It’s a leave in treatment which I comb through my hair when it’s damp. Not only does it help to detangle, but protects from UVA and UVB damage from the environment, and preserves hair colour. I’ve been switching between the Aveda Colour Conserve shampoo and conditioner, as well as a cheaper brand to make the products last longer. My second favourite is a product which previously for me has been all about function, but now, I’ve found one that is practical and pretty. Seriously pretty. I’m talking about the Tweezerman Eyelash Curlers which I picked up in the Birchbox Store (but talked about it in my Sephora Haul!). I’ve been using them everyday, and actually prefer them to my old Shu Uemura ones! 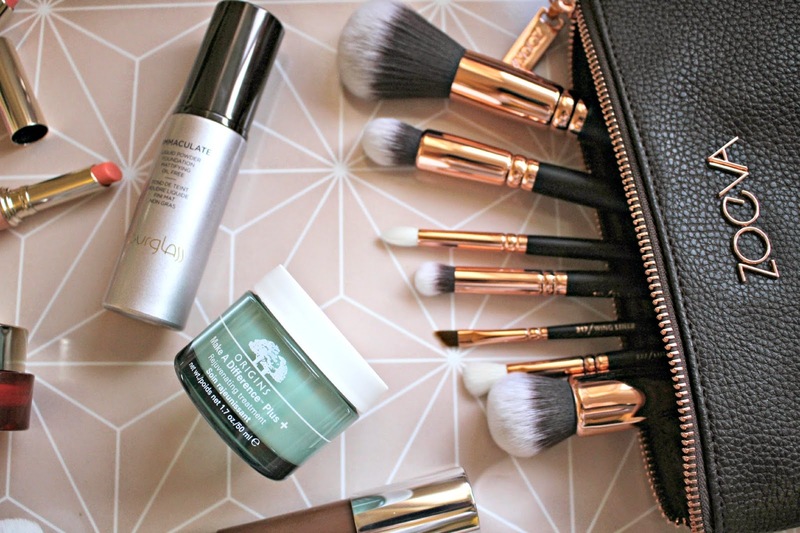 Skincare wise, my two favourite brands have stolen my heart again with these cult products. After I finished my Darphin VitalSkin moisturiser (which I also loved) I converted back to Origins and have been applying their Make A Difference Plus moisturiser every morning. My skin has been quite oily recently but still dry, if that makes sense, and this moisturiser seems to have completely calmed my skin down and regulated my oiliness (Gross sorry!)! My makeup has been looking far better for longer, and as with all Origins products, it smells great and is a pleasure to apply. After the moisturiser has been absorbed (I usually apply moisturiser, then go and make myself a cup of tea, get dressed, then carry on with my skincare routine!) I have been applying the Clarins Instant Smooth Perfecting Touch. I’m always quite conscious of my pore size and fine lines around my eyes but applying this wonder cream just makes everything vanish. I’m not sure what kind of witchcraft those lovely folk at Clarins are using, but this pot of silky smooth amazingness is just SO good at creating a perfect, flawless canvas ready for makeup application. Now I feel like I’ve unearthed a major gem here. I wouldn’t be over exaggerating to say that the Hourglass Immaculate Liquid Powder Foundation is my Favourite. Foundation. Ever. I’ve loved foundations in the past, but never has one been as good on my skin as this one. The liquid to powder foundation absorbs oil while giving enough coverage to cover any imperfections, and all day long the velvet-matte finish doesn’t budge. The formula absorbs sebum while regulating skin’s moisture levels, and the superfine pigments mean there’s no cakey-ness. I’ve never been able to go a whole day without touch ups before (even on my chin) but with the Hourglass foundation, I just find that my base completely stays put. Ooh and my next favourite is something that’s been on my wishlist for months and months now, and I finally caved in and purchased the Zoeva brush set in the beautiful Rose Gold design. I definitely didn’t need them as I have so many brushes, but as you may have guessed by now that I’m just can’t resist pretty things! And they don’t come much prettier than this! So far my most used is the Silk Finish brush for buffing in my foundation, and also the Luxe Sheer Cheek brush which I’ve been using to apply my highlighter. Clinique managed to covert me to using a balm for blusher (although it took me a while!) but now that I’ve mastered the blending of the blushers, I felt ready for level 2. The Contour & Highlight sticks! A new launch from the brand, the contouring sticks are applied in the same was as the blushers, you swipe it across areas where you want to create shadows, and blend using your fingers. If I want to go for a softer look, I’ll use a brush to pick up some colour from the stick and sweep it across my cheeks. The colour is warm toned which I prefer as it looks more natural, and I found the formula to be long lasting, and it didn’t go blotchy like my powder contouring products often do. As an oily skinned gal, I’m often wary of cream highlighters, but the Clinique Highlighting stick has no shimmer in it at all, and is very subtle, so I can swipe away with confidence that there won’t be any glowing stripes or harsh edges! The Clinique Chubby Stick Contour and Highlight sticks will be available from the 6th of February from Clinique counters and online. 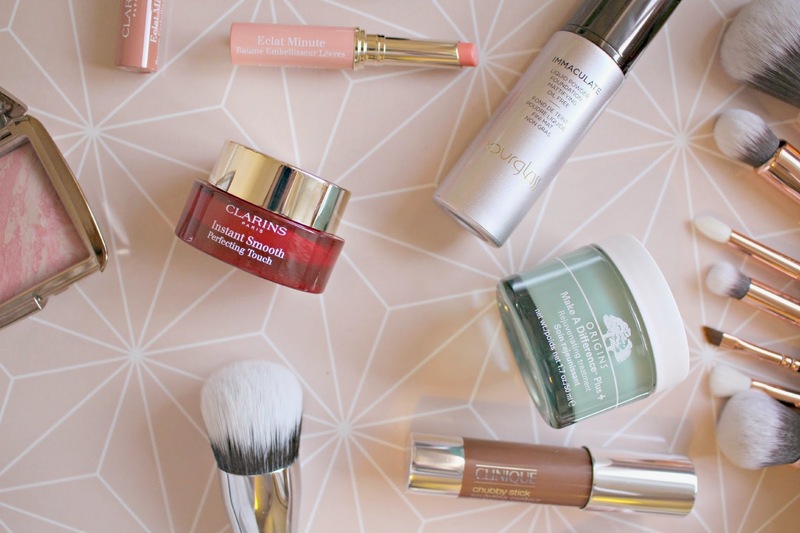 Another launch this month which got me really excited, was the Clarins Instant Light Lip Balm Perfectors which launched recently as part of the Spring 2015 collection. With 6 shades available, they all contain mango to nourish, and Vitamin E to boost hydration, so the look good, and do good too! 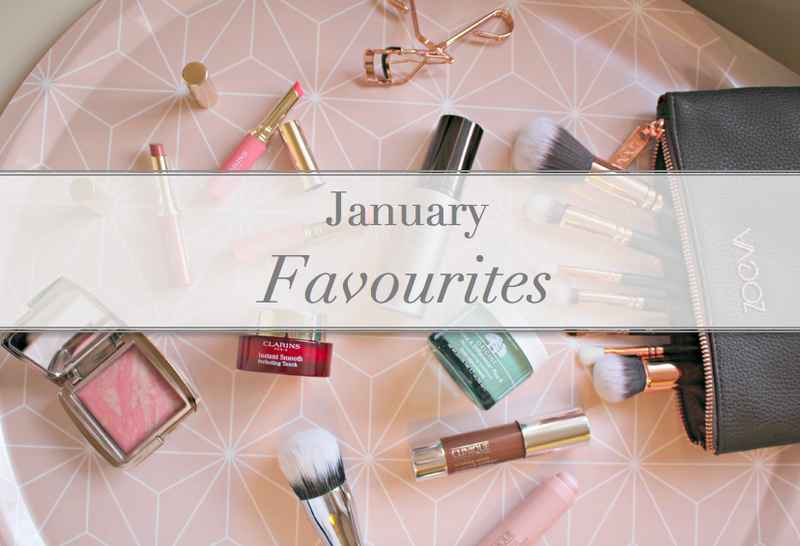 Once again, my main reason for featuring them in my January Favourites is because they are so pretty. I get abnormally excited when I pull one out of my handbag, and could just sit and gaze at their beauty! I don’t know if it’s because they are so mini and cute, or if it’s my magpie instincts swooning over the gold lid, but whatever it is, I’m obsessed. So many of you commented on their beauty after I instagrammed a picture of them, so I guess I’m not alone! They smell lovely and the formula gives a sheer coat of colour. I do wish the colour was a little more pigmented because they shades are so pretty, but you don’t really get so much of the colour on your lips. I have been applying the balms as the last step of my makeup routine, you know when you just don’t want your lips to be natural, but don’t want anything too in your face. Another product from my Sephora Haul which has made the cut into my daily routine is the beautiful Hourglass Ambient Lighting Blush. It’s unlike any blush I’ve tried before in that it has such beautiful depth; it gives my cheeks a luminescent flush which I love, especially as my base is usually matte. Hourglass is swiftly becoming one of my favourite makeup brands, and i’ll definitely be picking up more of their products next time I’m in New York! Finally, and again, one from the Sephora Haul is this mega Pro Large Domed Stippling brush, part of the Sephora Collection. I’ve been using it to create a more sheer foundation base, perfect for using with the Hourglass foundation which is quite thick, and I’ve also been using it to apply my Rimmel 25 Hour foundation (review here) on days when less coverage is required. It’s so big and soft that applying makeup is super speedy. So that’s it! So many beautiful looking products, and new discoveries this month, as well as some favourites from my most loved brands. I hope you’ve enjoyed reading about my favourites this month, let me know if you would like me to do a favourites post like this every month! What have been your favourite beauty products this January?